Aurelus, P.J., et al. 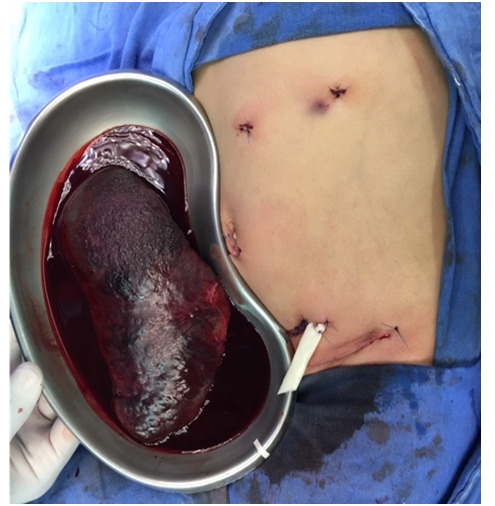 Alternative Incision to remove Larger Spleen in Laparoscopic Splenectomy in Pediatric Population: A Case Report. (2017) J Palliat Care Pediatr 2(1): 56- 59. © 2017 Aurelus, P.J. This is an Open access article distributed under the terms of Creative Commons Attribution 4.0 International License. Introduction: The introduction of laparoscopy in the early 1990s had given a new era in the surgical treatment of human diseases, laparoscopic surgery is a well-established alternative to open surgery across disciplines. The laparoscopic splenectomy proved to be a safe procedure, usually; the benefits of this procedure are widely recognized by a better cosmesis, reduced postoperative pain, shorter hospital stay and a good convalescence. Underwent, a single left pelvic incision we can remove a massive spleen without morcellated it, in a child by laparoscopic procedure. 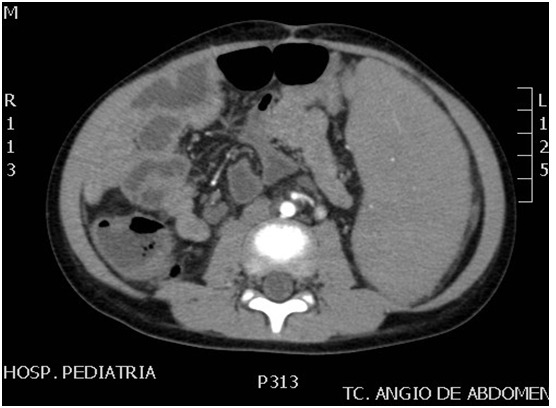 Case Report: A 3-year-old male child of 15 kg of weight and 1.2 cm of size with 2 years’ history of portal hypertension, esophagic variceal and gastrointestinal hemorrhagic secondary to portal cavernous degeneration. Clinical examination showed evidence of hepatosplenomegaly. We performed an abdominal ultrasound and computed abdominal tomography angiography to evaluate the vasculature and the size of the spleen to performed a laparoscopic splenectomy. Conclusion: Like we had seen in our case report and mentioned a lack of randomized controlled trial, the laparoscopic splenectomy is a technically feasible, safe and effective procedure for hypersplenism secondary to cirrhosis and portal hypertension, contributes to decreased blood loss and a shorter hospital stay and with this left pelvic incision we can remove a massive spleen without morcellated the spleen to prevent bag perforation or accident. The introduction of laparoscopy in the early 1990s had given a new era in the surgical treatment of human diseases, laparoscopic surgery is a well-established alternative to open surgery across disciplines. The terminology of hypersplenism was first appeared in the thesis of Anatole Chauffer in 1907, and subsequently in the study of Morawitz and Denecked. The spleen size, in patients with Portal Hypertension (PH), can be increased at 8 to 10 times of its normal size and retained 50 - 90% of platelets. Hypersplenism is classified in: primary hypersplenism (secondary to primary granulocytopenia, primary splenic pancytopenia and splenic anemia or pancitopenia), secondary hypersplenism (due to brucellosis, viralhepatitis, biliary cirrhosis, hemosiderosis, portal vein thrombosis, portal hypertension etc...), and occult hypersplenism. Recently in pediatric patients, the splenectomy is performed by laparoscopic procedure by its beneficious[1,2]. However, to remove a large spleen after laparoscopic procedure, many authors had to use diver’s surgical incisions. In children, there is no report in laparoscopic splenectomy, by using a single left pelvic incision. The laparoscopic splenectomy proved to be a safe procedure, usually, the benefits of this procedure are widely recognized by a better cosmesis, reduced postoperative pain, shorter hospital stay and convalescence[1,5]. The mean of this case, is given to know the feasible and the outcome in a child after removing a large spleen by this alternative left pelvic incision without morcellated the spleen by a laparoscopic procedure in our center (Centro Médico Nacional Siglo XXI, “Hospital de Pediatría Dr. Silvestre Frenk F”, IMSS*. A 3-year-old male of 15 kg of weight and 1.2 cm of size, was referred to our center with 2 year’s history of hypersplenism secondary to portal hypertension and portal cavernous degeneration. 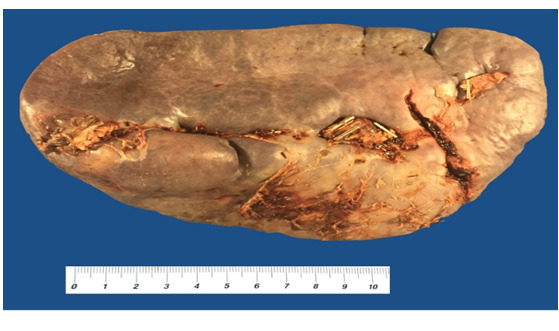 During this time, the child had prior history of esophagic variceal and gastrointestinal hemorrhagic. Physical examination showed evidence of hepatosplenomegaly. The patient had a good answer with the treatments for the PH but he has continued with thrombocytopenia with platelet count below 1.8 X 104. The patient was evaluated to perform a laparoscopic splenectomy. The child was received Pneumovax 15 days before the procedure with intravenous antibiotics as a preoperative prophylaxis. Abdominal ultrasound and computed tomography angiography revealed portal cavernous, permeability of the spleen vasculature and the larger of the spleen (Figure 1 and Figure 2). Figure 1 and 2: Computed abdominal tomography angiography showed caliber splenic artery and spleen size. The child was placed in a semilateral position on the right side with left arm fixed over the head and the operating table slightly tilted to the reverse Trendelenburg position. Generally, four ports were used. The first trocar (10 mm) was inserted at the lower umbilicus for placement an optic of 30° laparoscope, one trocar of 5mm was placed at level of the left side of the mid clavicular upper the umbilicus, also 10-mmtrocar was placed lower the umbilicus at the right side of the midclavicular for using the ultrasonic dissector (harmonic) and the endoscopic vascular clipper. We placed the fourth trocar (5 mm) in the subxiphoid position in the upper pole of the spleen (Figure 3 and Figure 4). Figure 3: Trocars positioning and pelvic left pelvic incision. Figure 4: Cosmetic aspect postoperatively. Dissection was performed using the harmonic. The splenocolic was first divided along with inferior pole vessels. This procedure was followed by dividing the gastrosplenic ligament, short gastric vessels and the splenorenal ligament. The splenic hilum vessels were divided by meticulous dissection and using clips to sectioning the artery and veins, we founded three veins with two arteries in the hilum. We were not morcellated the spleen to prevent accidents or perforation of the bag. A single incision of 5 cm in the left side of the pelvic patient was performed to remove the larger spleen (splenic weight, 457 g and more than 21 cm of large for a child of 15 kg of weight). A drain was placing in the left subfrenic area, at the site of the lower umbilical trocar for 2 days (Figure 3). Operative time was 182 min. The patient had not required transfusion during and after the procedure because he had an estimated intraoperative blood loss of 20 ml. The drain was removed on the second day; pain was assessed by visual analog scale for children and seemed to be minimized compared with the regular open splenectomy. The patient had not revealed any wound complication (Figure 4). The patient had a good outcome on the platelets account and he had been well enough to leave the hospital at three days postoperatively. Hypersplenism can produce severe thrombocytopenia, which significantly increases the risk of spontaneous bleeding and causing a later diagnostic and therapeutic procedure. Leukocytopenia due to hypersplenism may be also induced bacterial infections. This child had a massive splenomegaly that was been the purpose of this laparoscopic splenectomy procedure. 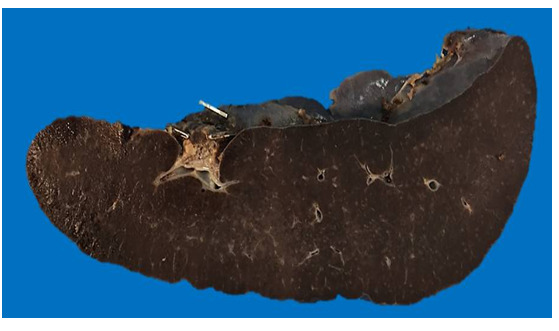 Targoma., et al, revealed, that a palpable spleen below the costal margin, or well, 3 times of size over the normal size of the spleen indicate a massive spleen. On the other side, in infants, the presence of palpable spleen tip 2 or more fingerbreadths below the costal margin were determinates plenomegaly, like it is the case, in this child (Figure 5 and Figure 6). Finally, the splenectomy causes a marked improvement in hematologic response and liver transplantation in patient with hypersplenism (Figure 7) secondary to liver cirrhosis. In our patient, the hypersplenism was secondary to portal hypertension due to a portal cavernous degeneration with liver cirrhosis[5,7]. 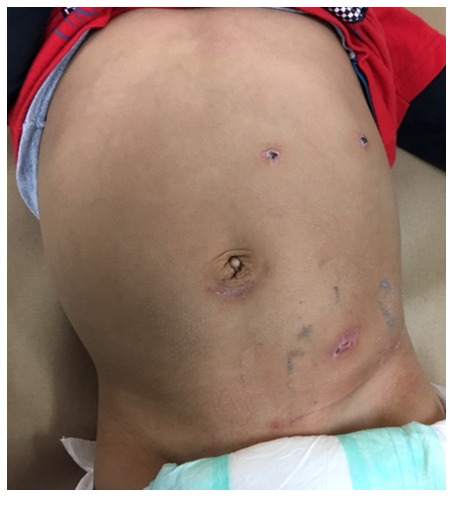 The principal objective in this case is giving to know the good outcome of this child by performed a single left pelvic incision to avoid large spleen without morcellated the spleen to prevent possible breach or perforation of the bag during the morcellated process. In fact, lager spleen or splenomegaly increases the difficulty to remove the spleen by laparoscopic splenectomy in infant. Figure 5: Larger of the spleen. Figure 6: Macroscopic aspect of the spleen. 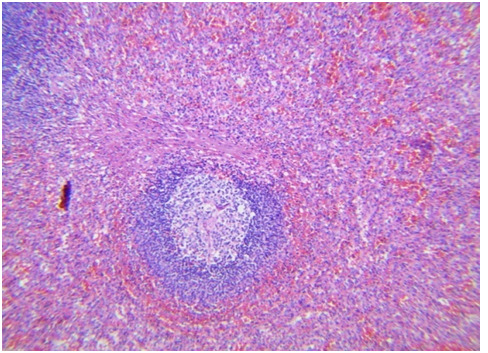 Figure 7: Histological examinations describe the hypersplenism. Currently, minimally invasive surgeries seek to reduce access trauma and treated to use natural orifice like transluminal endoscopic surgery. However, most procedures performed in general surgery use conventional open techniques, only a small proportion of patients benefiting from the minimally invasive surgical approach, recently laparoscopies are becoming the preferred modality for concomitant cholecystectomy and splenectomy, (Figure 8)[8,9]. Figure 8: Spleen aspect in the operative time. There are various incisions studies in the performance of laparoscopic splenectomy like the yin-yang and Z incisions, the umbilical Benz incision, incision in the right subcostal area and 3 additional trocars positioned by Dublin and Ireland, modification like the utilization of a right-angle light cord adaptor, respectively for improved cosmesis. However, in child there is no report of left pelvic incision to remove larger spleen in the laparoscopic splenectomy, like it is, in our case report[6,8,10]. There are numerous factors that contribute to success in this procedure, such as, the etiology of the splenomegaly, patient age, the organ size and the ability of the surgeon to execute minimally invasive operations. In our report, we had a child with a large spleen of 21 cm and 457 g of weight secondary to portal cavernous degeneration in witch, underwent 5cm single left pelvic incision technique without popularity in the pediatric surgery, we achieved the procedure and removed the large spleen without complications, by them, the purpose of this report is giving to know this alternative incision in that population. Single incision laparoscopic surgery for splenectomy predates that splenectomy is more common in the adult population, Fan and associates were able to identify 29 studies that described 105 cases of splenectomy. Like mentioned Xiao-Li., et al, the Laparoscopic Splenectomy (LS) is a technically feasible, safe, and effective procedure for hypersplenism secondary to cirrhosis and portal hypertension and contributes to decreased blood loss, shorter hospital stay and less impairment of liver function. In our patient with this characteristic, we had 30 ml of blood loss; the hospital length of stay was 3 days and a good recuperation in the platelet count and the liver function. The other importance of this case is that historically, splenectomy was considered a contraindication for LS because the working space is limited, especially in children. In fact, large spleen may be interfered with: visualization, identification, isolation and division of its vessels. Moreover, the size may be caused difficulty by the spleen extraction using either a bag or additional incision. In our pediatric patient with an unusual incision, we had demonstrated that is safety and feasibility to remove this massive splenomegaly[13-15]. Although, laparoscopic splenectomy is the preferred technique for the elective removal of normal-sized and moderately enlarged spleens, in infant, it is a value to avoid a larger spleen in the management of splenomegaly for surgeons with advanced laparoscopic technique. Even thought, the laparoscopic technique is more challenging when it is performed in patients with cirrhosis, portal hypertension and splenomegaly. Many authors performed a liver biopsy during the chirurgical procedure to assess liver disease activity, in our child; the biopsy was performed previously without cirrhosis activity[6,10,14,-16]. Like we had seen in our case report and mentioned a lack of randomized controlled trial, the laparoscopic splenectomy is a technically feasible, safe and effective procedure for hypersplenism secondary to cirrhosis and portal hypertension, contributes to decreased blood loss and a shorter hospital stay. Our contribution, with this left pelvic incision, is continuous with those benefices and removed large spleen without morcellated the spleen, like a prevent middle, in the pediatric population. 1. Barbaros, U., Dinccag, A. Single Incision Laparoscopic Splenectomy: The First Two Cases. (2009) J Gastrointest Surg 13(8): 1520-1523. 2. Yunfu, L.V., Wan, Y.L., Yejuan, Li ., et al. Hypersplenism: History and current status (review). (2016) Experimental and therapeutic medicine 12: 2377-2382. 3. de Lagausie, P., Bonnard, A., Benkerrou, M., et al. Pediatric laparoscopic splenectomy: benefits of the anterior approach. (2004) Surg Endosc 18(1): 80-82. 4. Joshi, M., Kurhade, S., Peethambaram, M.S., et al. Single-incision laparoscopic splenectomy. (2011) J Minim Access Surg 7(1): 65-67. 5. Zhu, J.H., Wang, Y.D., Ye Z.Y., et al. Laparoscopic versus open Splenectomy for Hypersplenism Secondary to Liver Cirrhosis. (2009) Surg laparosc Endosc Percutan Tech 19(3): 258-262. 6. Seims, A.D., Russel, R.T., Beierle, E.A., et al. 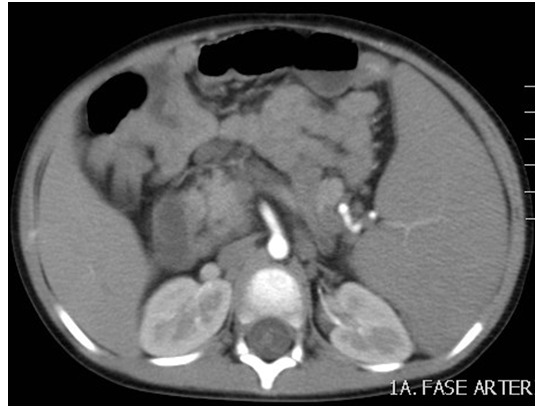 Single–incision pediatric endo-surgery (SIPES) splenectomy: what dictates the need for additional ports? (2015) Surg Endosc 29(1): 30-33. 7. Zhou, J., Wu, Z., Pankaj, P., et al. Long–term postoperative outcomes of hypersplenism: laparoscopic versus open splenectomy secondary to liver cirrhosis. (2012) Surg Endosco 26(12): 3391-3400. 8. Pietrabissa, A., Morelli, L., Peri, A., et al. Laparoscopic Treatment of Splenomegaly. A case for Hand-assisted Laparoscopic Surgery. (2011) Arch Surg 146(7): 818-823. 9. Pal, K. Modified port placement and pedicle first approach for laparoscopic concomitant cholecystectomy and splenectomy in children. (2010) J Indian Assoc Pediatr Surg 15(3): 93-95. 10. Amano, H., Uchida, H., Kawasima, H., et al. The umbilical Benz incision for reduced port surgery in pediatric patients. (2015) JSLS 19(1): e2014.00238. 11. Poulin, E.C., Thibault, C. Laparoscopic splenectomy for massive splenomegaly: operative technique and case report. (1995) Can J Surg 38(1): 69-72. 12. Zhan, X.L., Ji, Y., Wang, Y.D. Laparoscopic splenectomy for hypersplenism secondary to liver cirrhosis and portal hypertension. (2014) World J Gastroenterol 20(19): 5794-5800. 13. Zhu, J., Ye, H., Wang, Y., et al. Laparoscopic versus open pediatric splenectomy for massive splenomegaly. (2011) Surg Innov 18(4): 349-353. 14. Cai, Y.Q., Zhou, J., Chen, X.D., et al. Laparoscopic splenectomy is an effective and safe intervention for hypersplenism secondary to liver cirrhosis. (2011) Surg Endosc 25(12): 3791-3797. 15. Fan, Y., Wu, S.D., Kong, J., et al. Feasibility and safety of single –incision laparoscopic splenectomy: a systematic review. (2014) J Surg Res 186(1): 354-362. 16. Altaf, A.M., Ellsmere, J., Jaap Bonjer, H., et al. Morbidity of hand –assisted laparoscopic splenectomy compared to conventional laparoscopic splenectomy: a 6-year review. (2012) Can J Surg 55(4): 227-232.